Hello ladies and perhaps a few gents. I’m away at Alison Smith’s sewing school learning the secrets of bridal couture. It’s an amazing three day workshop where you make a crazy sample that incorporates lots of techniques that you might use in bridal but probably not in one dress! More to come on that. If you follow me on Instagram you will have seen I’ve been trying out some embroidery lately. 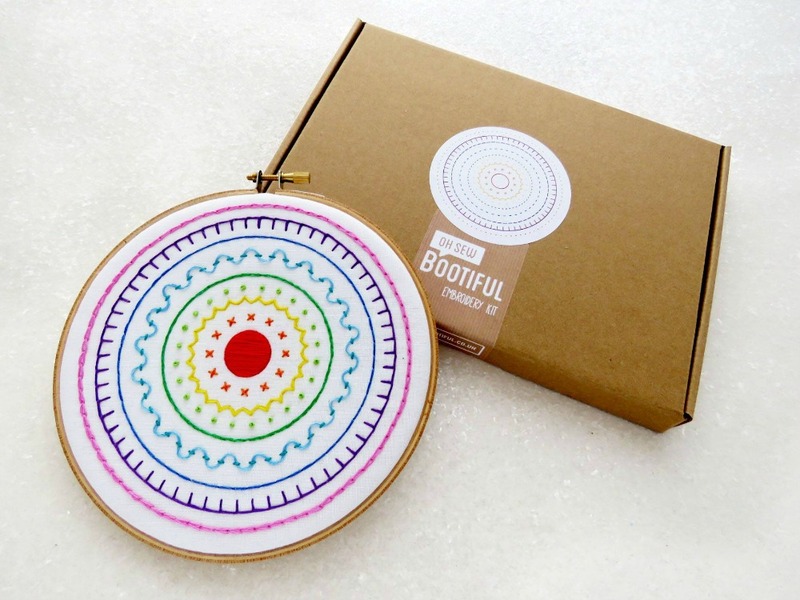 It started with a boost to put more embroidery in Love Sewing and then the etsy team offered me a kit to try as a thank you for supporting the site. 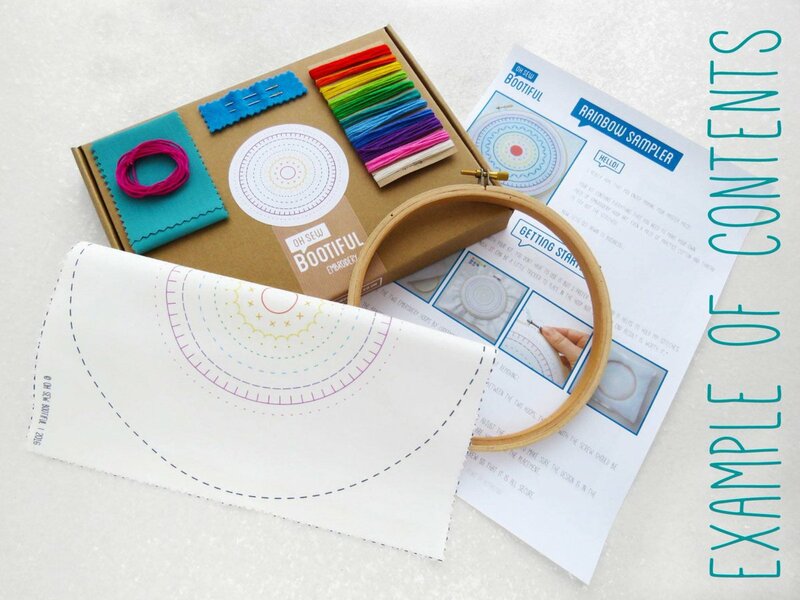 They sent the rainbow sampler from Oh Sew Bootiful which was a fun intro to the basics. I then jumped on the pre-sale for the Flowers and Bees kit when I saw it. This wasn’t long after the Manchester attack and the thought of embroidering bees, the symbol of the city brought me some comfort. 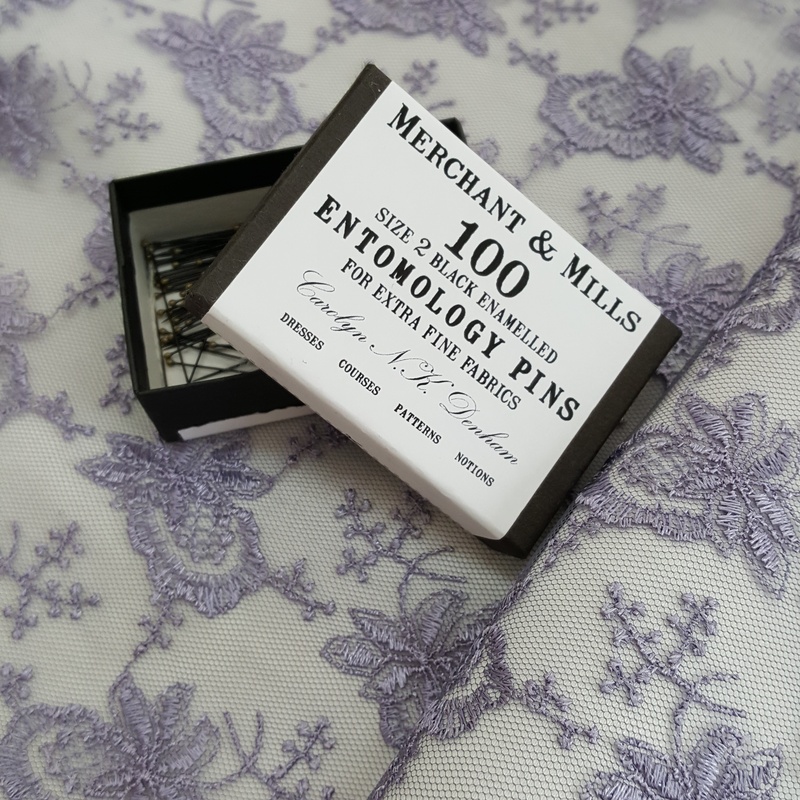 Both kits feature very clear step by steps with photos and vector style illustrations, a stitch guide (which doubles as a template if you trace it), a pre-printed piece of cotton, spongy wadding, more than enough floss wound on a card, a practice piece of cloth plus two gold eye needles. Phew! Well worth the money I say. I worked sporadically and threaded each of the needles up with a different colour so I could choose as my mood suited what to stitch. Only a couple of areas dictate the order you work in, e.g. where a stem stitch is then covered by a flower petal on top. I targeted easy stitches first like French knots and split stitch to gently get going. Towards the end it was then mostly satin stitch so I used five pre-threaded needles to keep up momentum. Stitching during my lunch hour was very calming but not always possible. A good session in the garden during the hot spell saw a lot more get done and then a week in centre parks with my in laws saw me complete the rest. As I moved around the hoop my technique massively improved and I went back and did two daisies again for a better finish. The bees are absolutely wonderful with the shade of eggy yoke yellow singing out at you. The centre of the poppies were quite hard to keep defined and I will say there’s A LOT of lazy daisy stitch to do. With lazy daisies and French knots you really need both hands so a table to work on is a must for a neat finish. I’ve hung this hoop in my sewing room and it always catches my eye as I pass it. I’d really recommend this pattern. And honestly think the kit is worth the money for the quality and quantity of supplies included. I had to source my own felt for the backing but that was easy and now I’m itching to start another project. Mindbogglingly a photo of my rainbow hoop shared on social media won me a of pattern of my choice from Oh Sew Bootiful’s online shop. Steph the owner picks four winners a month so get sharing your pics if you make one of her designs!! I chose the Hearts and Flowers template so watch this space for that one. 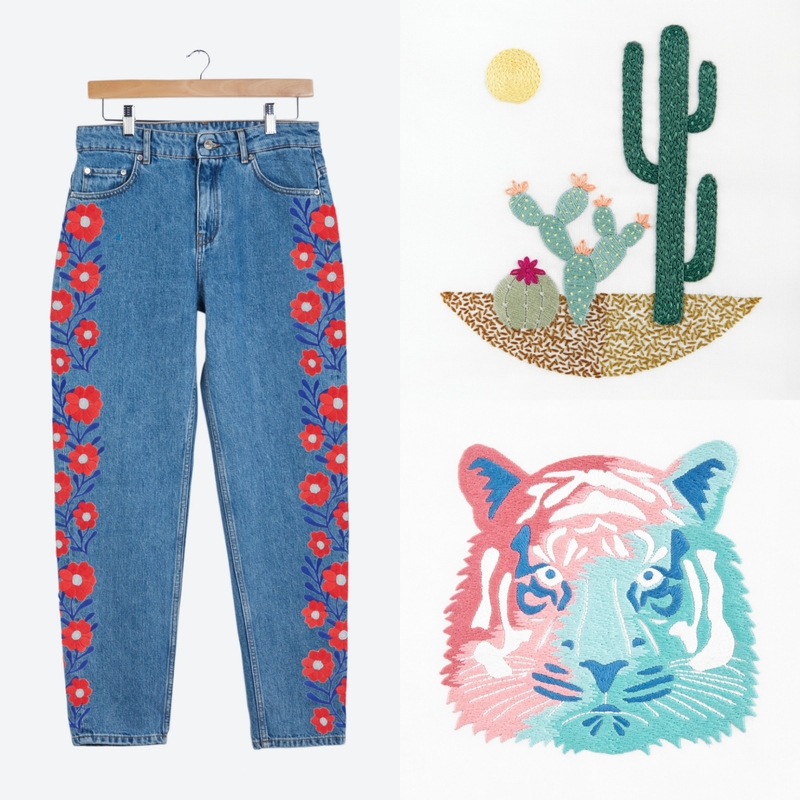 Have you ever tried embroidery? 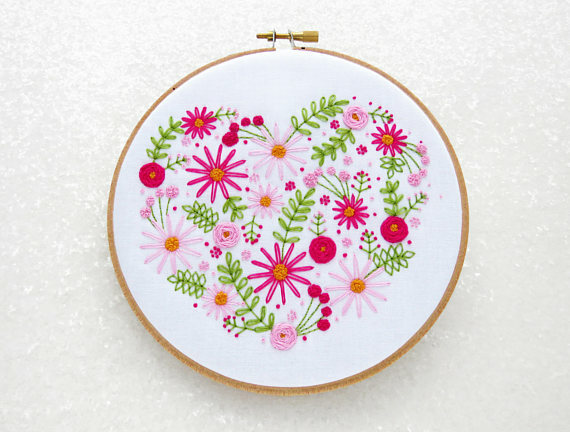 There are LOADS of fantastic free patterns on offer at DMC if you sign up to their newsletter. I’m going to try some of the florals and succulents soon. Maybe also this tiger!! What do you think?